With Jeff, Scott and Pat. Round trip 5.6 miles, total time 7 hours 40 minutes, total elevation gain about 2500 feet. Click here for TOPO.EXE v3.4.3 TPO file. Click here for MAPSOURCE.EXE v6.9.1 MPS file. Click here for GPX text file. GPS data includes tracks and waypoints for parking, trail forks, etc. 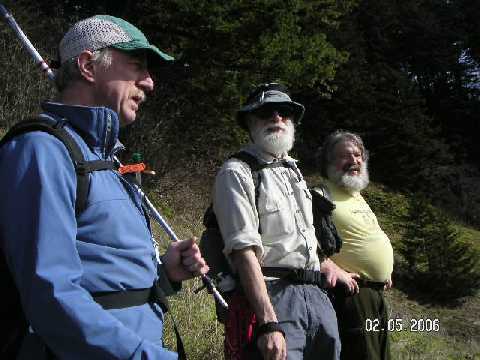 Hiked up and around Archer Mountain, Columbia river gorge w/ Jeff, Scott, Pat. Getting there: 12.5 miles E of Washugal on hwy 14. turn left (north) onto Smith Cripe road. drive to it's end (1.5 miles). lots of parking space. Many options on archer mountain start here... there's the direct route up the south face - very direct... I haven't done this but you can find some info on this on the web and I think the Mazamas go this way. We approached over the "west shoulder". alternative routes are: up the creek and then south east to the summit and lookout (not recommended, ie. reversing the route we did this day) or gaining altitude on the bluffs due north of the parking area, hiking farther north and then again south east to gain the summit - also a route I haven't done. Our route was 5.60 miles round trip with 2500 feet of elevation change. We started at 11:10 AM and got back to the car at about 6:50PM... so 7 hours 40 minutes in total, including stops for rest, food, views, etc. Note - after our trip I did some sleuthing on the web and discovered that some of our route may not have actually been officially open to the public. See my remarks and links at the very end. 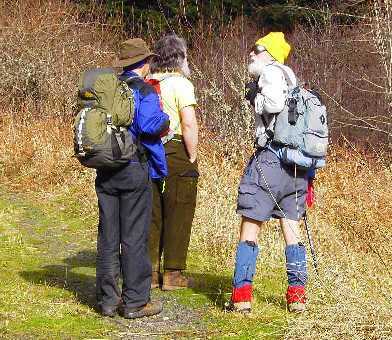 I don't think this is a popular hike - maybe it's not in the books - but people are doing it. The Mazamas seem to schedule trips here and the geo cachers hide there geo caches here. The trails aren't "well traveled" but they are traveled" so SOMEONE is coming up here. There's lots of potential for exploring. 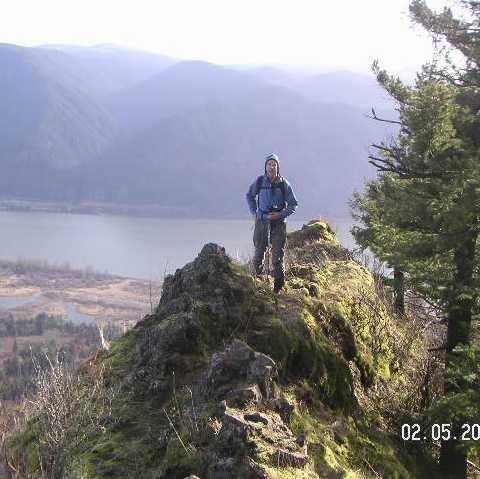 I'm back, hiking in the Columbia River gorge. I grew up in Portland and don't get back that often. When I do I try to reserve a day for a hike in this, one of my favorite place to hike in the world. There seem to be more cool views, waterfalls, cliffs, big trees, shear beauty, places to explore and general adventure per square mile than anywhere. I should mention that in the last two months both Portland and my home in Seattle were going for new records for most rainy days in a row - personally I was rooting for the rain. And this weekend I leave behind reports of 90 mph winds in Seattle. So... I come prepared for bear - I'm going to hike no matter what... but... I awake this morning to no rain and glorious blue skies - the first nice day in two months! Yee hah! We follow the road north-ish out of the parking area and into the lower meadow. After only a 100 yards we are immediately rewarded with cool views of the basalt bluffs on the west flanks of Archer Mountain and defining both sides of the drainage of Archer Creek. It looks like there are some fun places to explore! Scott has been here several times before as well. I'm the newbie. 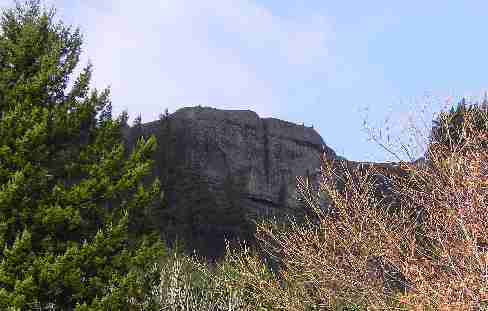 The plan is to approach the Archer peak view point by winding up through the cliffs on the west side of the peak. 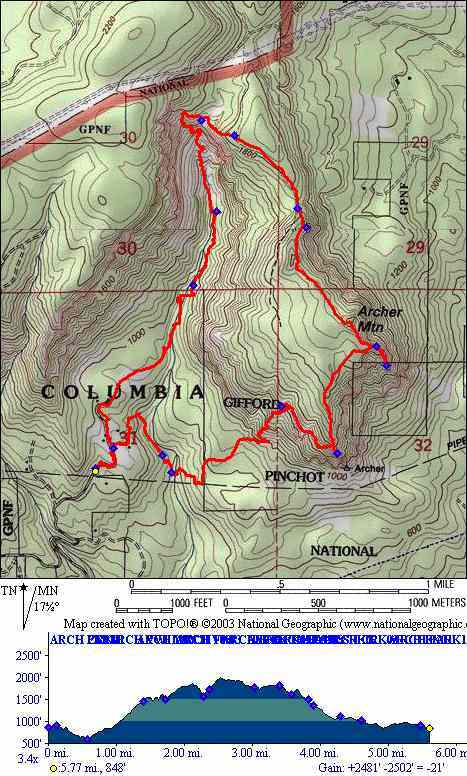 From there we will hike north over the summit proper toward the upper reaches of Archer creek. There, we will make a decision to either follow the creek bed back, or come back across the top of the big bluff west of the creek valley. We leave the road and head downhill through the meadow on a small trail that reaches and then crosses the creek and then heads up. 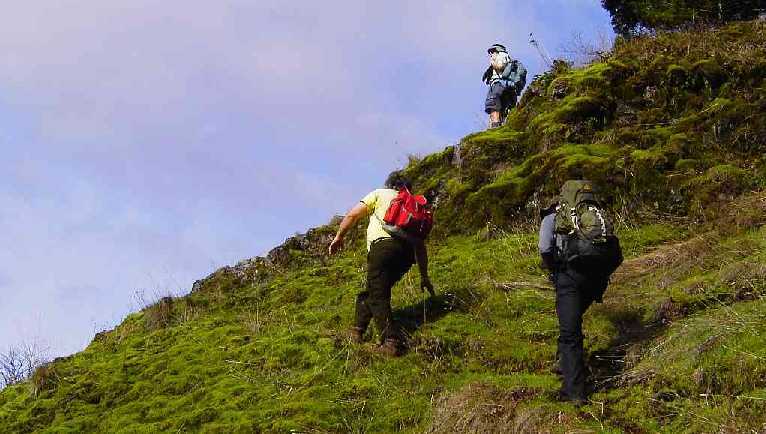 The trail crosses all manner of terrain - passing between and along the tops of vertical cliffs, crossing steep hill sides and talus slopes, finally climbing over a steep, very short rocky ridge to lead to a cool little grassy knoll overlooking the valley and cliffs to the west. We're off again heading southeast. With the steep ground behind us the trail is mostly traversing now, along numerous steep talus slopes and the tops of airy, bottomless cliffs. We're treated by teaser views into the gorge, at one point looking all the way back to Cape Horn with two? very faint but very full waterfalls. 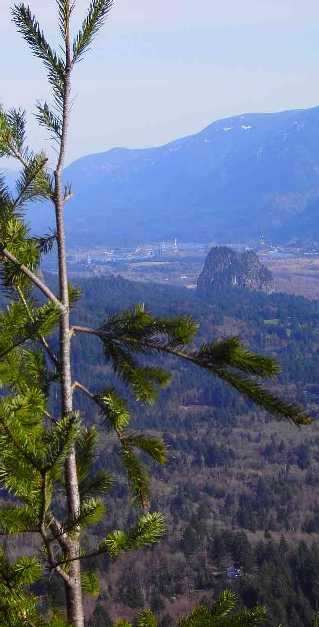 At 1:30 we reach the wooded notch that separates the summit from the lookout point. (a faint trail joins us here that Scott says is the direct south face route.) 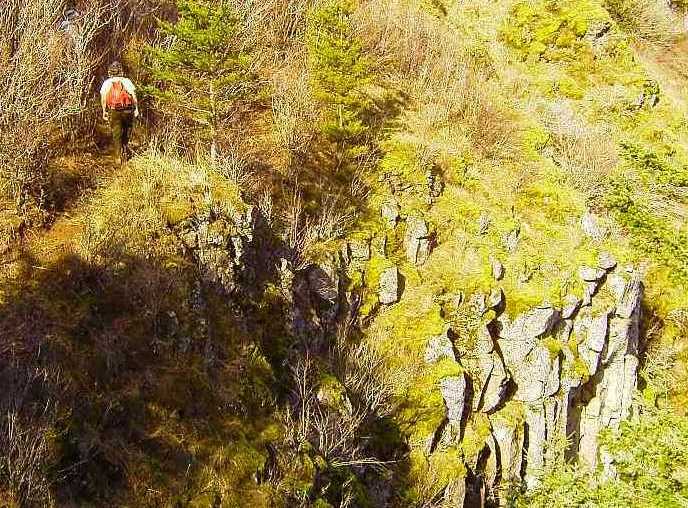 Turning right we do a short, avoidable scramble and then walk the narrow ridge out over 800 foot cliffs to a little perch with one of the most spectacular views in the gorge. We settle down for a leisurely lunch and take it all in: Multnomah falls across the river is full, Horsetail falls, St Peters dome, Devils backbone, Larch mountain with a dusting of snow on top, beacon rock, Bonneville dam, Hamilton mountain, Cape Horn, the Columbia River 1500 feet below us and the list goes on. Jeff and Scot crack celebratory beers. While the boys are gazing across the way and planning future hikes I notice two interesting looking birds gliding over the forest way way below us. 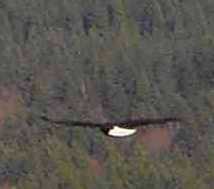 One fans brilliant white tail feathers identifying them as bald eagles. So cool! They circle next to the cliffs and in a few minutes they rise the 1000 feet to be even with us! 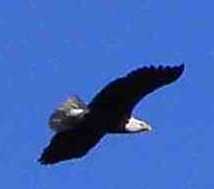 They briefly eyeball us and a minute later they're another 500 feet above us in the clear blue sky! At 2:40pm we start back - taking the small trail straight up the hill to the the "summit" area. On the flat ground on top, we head northwest - the trail comes and goes, mostly following the edge of steep slopes to our right. 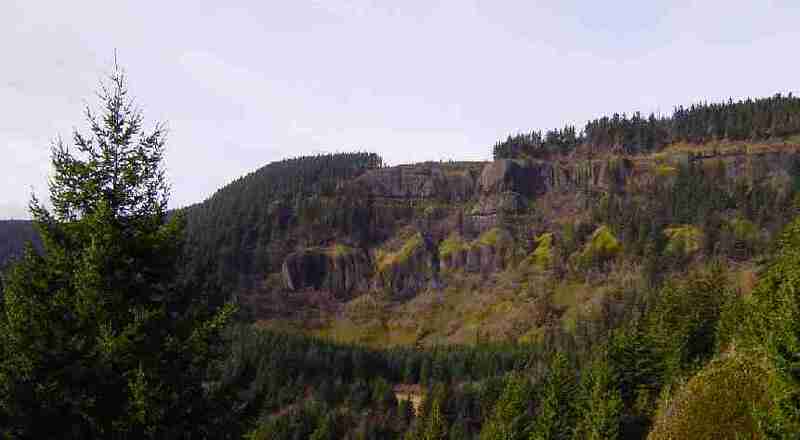 It becomes more well defined as it heads downhill and drops onto an old road after about .75 miles from the lookout. 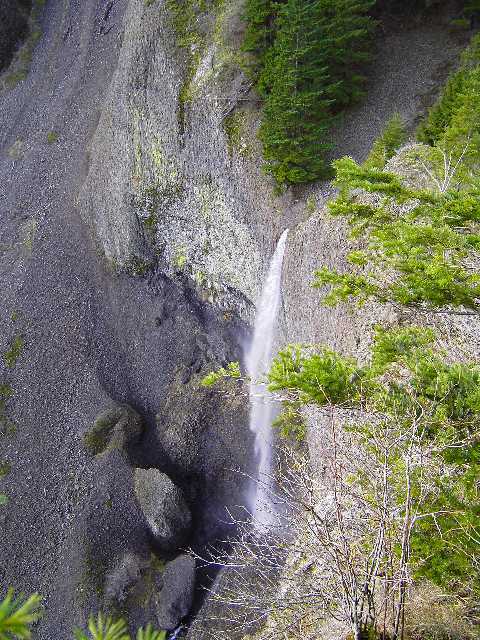 We go right (northish) for a little less than half a mile to a saddle where we leave the road to the left to find a small trail that leads to several spots where we peek out through the woods over spectacular vertical cliffs where Archer creek falls into it's valley. It's apparently windy down there - I can't see the falls but the air in front of us is full of spray, sparkling and floating in the sunshine. The "trail" opens into a grassy area above the creek where we are surrounded by cliffs and looking south down the drainage. The recent rains have contributed to 5 or six little ribbon waterfalls. What an awesome place. 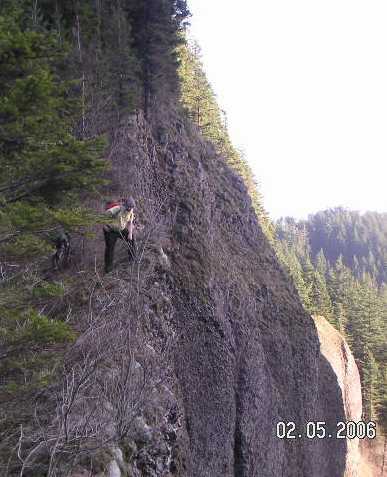 From here we can see a big talus slope spilling out of ravine ahead of us. It's time to decide if we're going to head out following the creek or continue along the high ground to the west. After some discussion we opt for the creek. The talus is our goal. 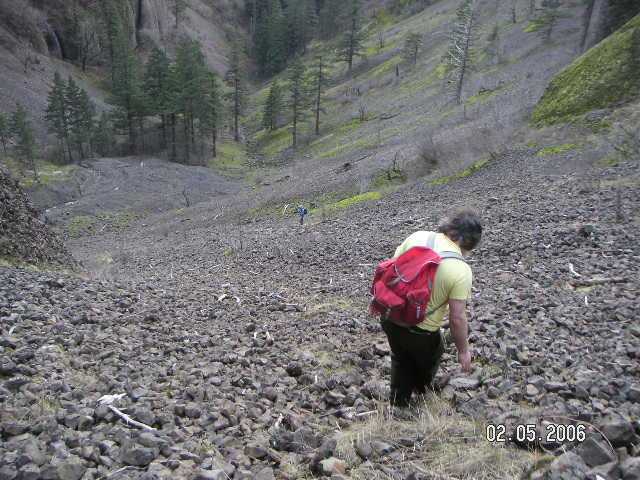 This involves hiking a brief bit down to the creek and then a ways up the the opposite hillside, keeping left to find a steep, vegetated, treed, muddy, loose crappy gully that leads down to the talus. Not sure this would be passable in the summer but at least it would be dryer. Once on the rock, the going was relatively easy, descending between big 80 foot cliffs to finally see the creek falling 150? feet over in cut basalt. 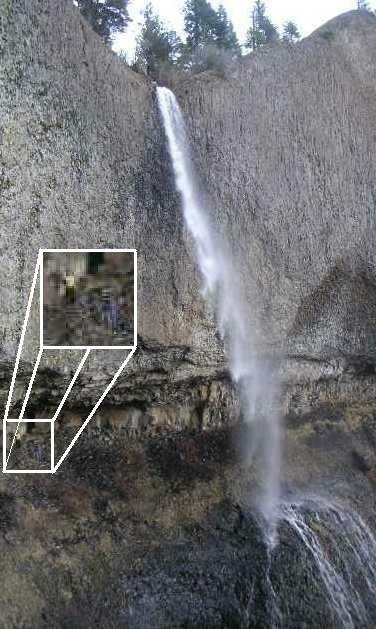 See Chris (3 blue pixels) and Jeff (6 yellow pixels) on the far left side behind Archer Falls. When the boys had been here before, it was always summer and the falls were only a trickle not even reaching the ground but today they're probably as full as they ever get. Jeff and I muster some kodachrome courage and brave steep scree and some loose rock to climb under the falls for a picture. Here we find a critter burrow and the remnants of its last snack? : two BIG wings! From here we have about a mile of creek bed to follow - the boys conjecture that this might be awful... it WAS a little less than awful, mercifully defoliated by winter, but wet and muddy and rocky and stickery and... eventually... dark. The trail actually started out pretty nice, winding through the rocks and moss and little stands of big, old firs. But it simply got worse and worse until it mostly wasn't there at all. Pat had sped ahead and I had lagged behind (having GPS battery problems). After about a mile Scott and Jeff and I decided to climb the western hillside. Jeff and I continued on an adequate trail that paralleled the creek while I could see Scott's headlamp above us where he said he was looking for a road. Jeff and I made good time to where our trail joined a road that shortly led to the upper meadow where we laid out under the stars to wait for Scott. Awesome stars, no wind, not too cold - it was a beautiful night. Scott showed up about 10 minutes later and we followed the road to find Pat waiting for us in the lower meadow and then a short walk led to the car. 5.6 miles, total time 7 hours 40 minutes. After the fact, I did some web searching and discovered that the area under the falls (and elsewhere?) 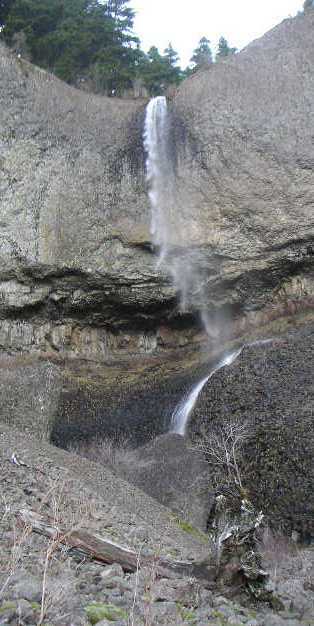 is part of the Department of Natural Resources (DNR) "Natural Areas Program (NAP)" and is part of the Columbia Falls Natural Area. We probably weren't supposed to be there - though none of this is posted at the site. I'm still kind of unclear on the exact restrictions and the actual boundary of the affected area. At this time I could find no definitive map. 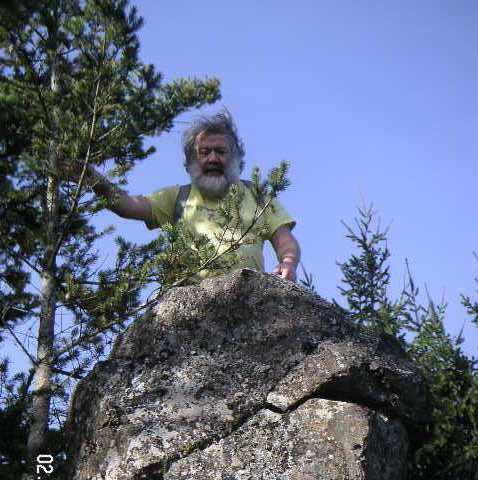 WA state DNR Major public lands map : This geocache site has a conversation with a DNR official. You have to be a member of the site to see it though. Click on this link, it will say "cache not found", become a member of the site, then re-click the link. The conversation is at the bottom of the page. You may have to click a link at the very, very bottom of the page in order to see the entire conversation. Geo cache site. If that link doesn't work for you, try this one. Geo cache site.